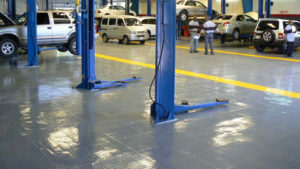 Our Garage Floor Tiles are one of the best garage flooring options by any measure. They are beautiful in appearance, easy to install and virtually indestructible. They are specifically designed to withstand the wear and tear from twisting/turning car tires on a daily basis. This is important because even though other types of tiles that are being recommended for installation on your garage floor can be installed in your garage doesn’t mean they are garage tiles! 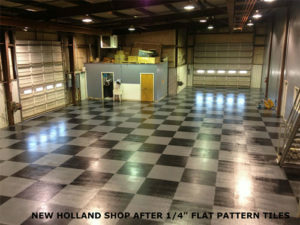 For instance, we read a lot about porcelain tiles being used as garage floor tiles. This make no sense to us. Porcelain tiles need to be set in a cement base commonly called a mud base. This could add up to an inch or more in height to your floor. Porcelain is extremely slippery when wet and the grout joints are a never ending headache. They’re also prone to cracking and chipping form dropped tools or other items. VCT tiles are no better, they will crack, chip and peel up eventually. VCT is also very prone to wearing out very quickly from tire abrasion. Once your porcelain or VCT tiles fail you have a huge problem as in an inch of cement or black mastic adhesive stuck to your floor! So while garage tiles can be used in just about any other tile application on any other floor, the opposite cannot be said for porcelain or VCT tiles. Interlocking garage tiles are easily removable should you damage one or decide to take them with you when you move. We offer 4 patterns, Coin, Textured, Diamond and Slate. All offer good slip resistance while still looking stylish. They also come in various colors that you can use to make checkerboard patterns, borders and other custom designs. Our tiles differ from most other tiles due to the fact that they are solid virgin PVC as opposed to recycled hollow core polypropylene tiles. Our tiles weigh 4-6lbs as opposed to less than a pound for most of our competitors. There simply is no comparison no matter how well marketed the competition is. Structural Integrity: With interlocking T-Joints you won’t get spread or separation.